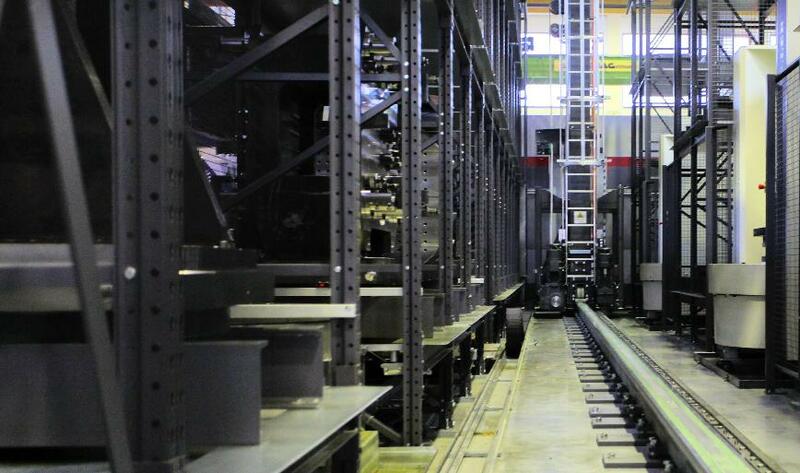 The flexible pallet storage unit is a shelving system that is used in order to store the machine pallets, as well as the raw and finished parts (optional) required for manufacture. The shelf is a steel structure consisting of vertical and horizontal beams. In order to position the machine pallets, pallet-specific cross beams are attached between the horizontal beams. The storage shelf is attached to the floor by means of expanding type foundation bolts. Shelf pallet location: Below the machine pallet locations, there are collection pans for dripping coolant. The coolant is guided from the pans via a pipeline and can thus be directed into a collection tank and/or returned to the machine.